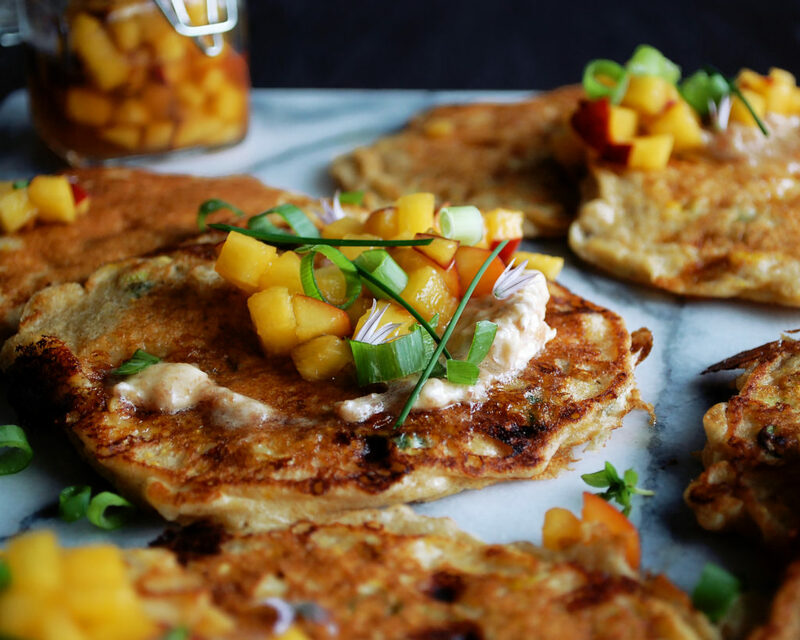 These are savory pancakes with a just little bit of all my favorite summer ingredients. 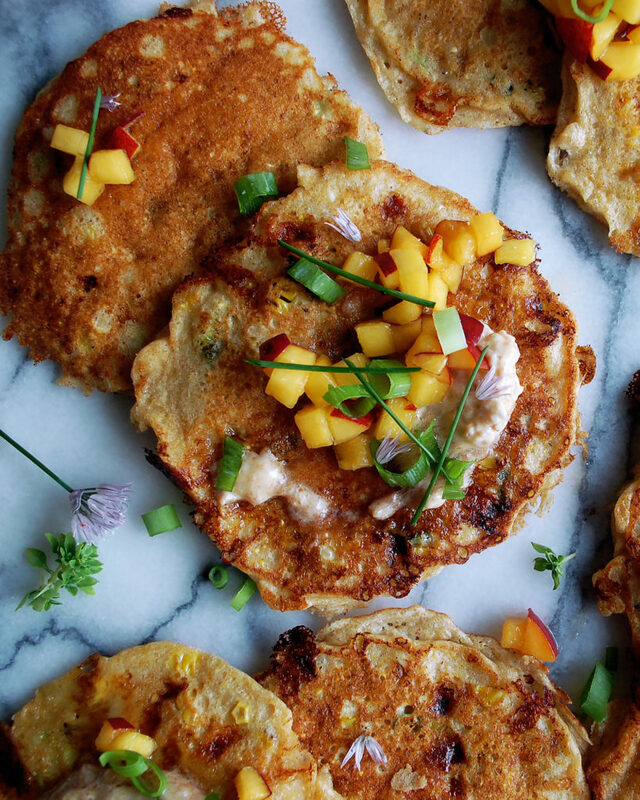 Corn, zucchini, peaches…these just scream summer to me. A while ago, I created a basic pancake recipe that I absolutely love. To me, it’s perfect. Since then, every time I want to make pancakes, I just keep making variations on that recipe. 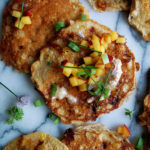 One of my favorites being these Lemon Ricotta Pancakes, and now this…a savory cornmeal pancake full of charred corn, sautéed zucchini and scallions, and lots of parmesan cheese. AND, the best part about these is a secret ingredient: cottage cheese. I was extremely intrigued by the idea of cottage cheese in a pancake. I finally tried it and the result was wonderful. The addition of whipped egg whites folded into the batter, plus the cottage cheese, resulted in an extremely unique textured pancake. A little thinner than normal, super airy, slightly crispy exterior, and oh so soft on the inside. Not to mention, cottage cheese adds a nice protein boost to the pancakes. And since I used whole wheat flour, no added sugars, and lots of vegetables, I would say they are the perfect healthy breakfast for summertime. I’ve also added some really simple toppings: peach honey syrup and prosciutto butter. For the peaches, you simply just dice them up and let them sit in honey for at least 30 minutes. As they sit, the honey draws out some of the liquid in the peaches, and a wonderful syrup is created to drizzle right over the pancakes. If sweet and savory is your favorite combination like mine, this is right up your alley. And then there’s the prosciutto butter. 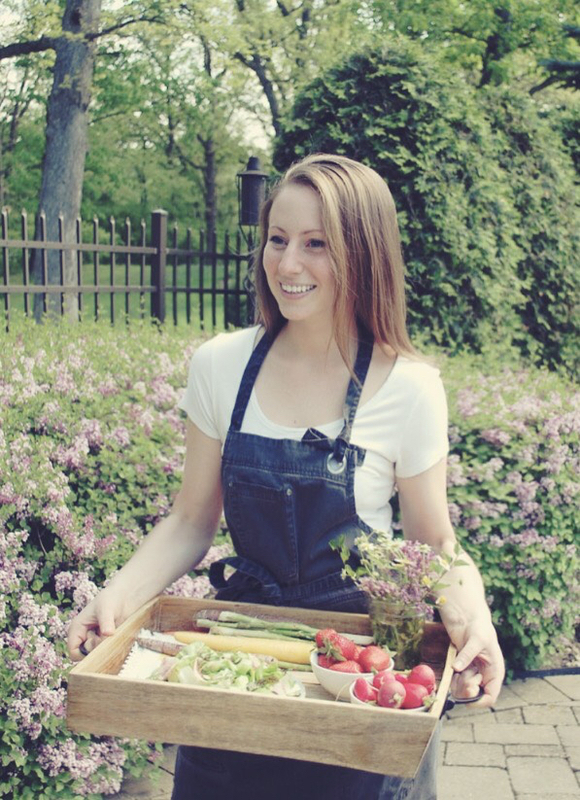 I got this idea from Sarah Gruenberg of Monteverde in Chicago, who just won a James Beard Award for Best Chef: Great Lakes. One of her signature dishes, which I saw her make at the Worlds of Flavor Conference in Napa a few months ago, is a prosciutto butter toast, or PBT for short. It’s to die for. I created a version of the butter for the top of these pancakes, because as long as we are doing the savory thing we might as well go all out with it. 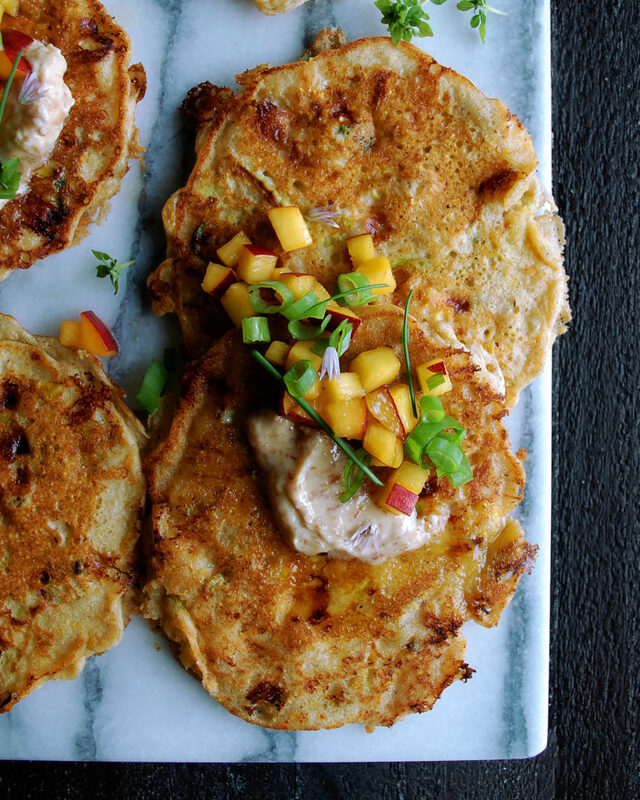 So you’ve got cheesy, savory pancakes, sweet peach honey syrup, and salty, creamy prosciutto butter. Enjoy! Combine the peaches and honey in a mixing bowl. Stir well. Let sit for at least 30 minutes, or until ready to serve. Preheat the oven to 375F. Place the ears of corn (with the husks intact) on a sheet pan and roast for 30 minutes. Remove the corn, let it cool slightly, and then remove the husks. On a very hot grill, char the corn until caramelized and tender. Let the corn cool. Slice off the kernels and reserve. Use a peeler to shave the zucchini into thin strands, only working up until you hit the seeds. Roughly chop the scallion. Heat a large sauté pan over medium heat. Add enough oil to coat the bottom of the pan. Sauté the zucchini strands and scallions until caramelized and tender. Reserve. Whisk the whole wheat flour, cornmeal, baking powder, and salt together in a large bowl until incorporated. In a separate bowl, beat the egg yolks. Add in the cottage cheese and whisk until smooth (you should still have small lumps from the cottage cheese). Add the milk, lemon juice, and lemon zest to the egg mixture. Whisk to combine. Slowly pour the wet ingredients into the flour mixture, whisking until the flour soaks up the liquid and the mixture is homogenous. Stir in the corn, zucchini, scallions, and parmesan cheese. In a separate bowl, whip the egg whites until they reach stiff peaks. Gently fold the egg whites into the pancake batter using a rubber spatula. Heat a griddle or skillet over medium heat. Working in batches, add a tablespoon of butter at a time to the griddle or skillet and let it melt. Ladle the pancake batter onto the surface, creating your desired size pancakes and evenly spacing them apart. Cook on one side until golden brown and bubbles begin to form on the top. Using a spatula, gently flip the pancakes over and finish cooking on the other side. Keep the pancakes warm as you finish cooking all the batter. Combine the softened butter and prosciutto in a food processor and blend until smooth. Keep the butter at room temperature for serving. 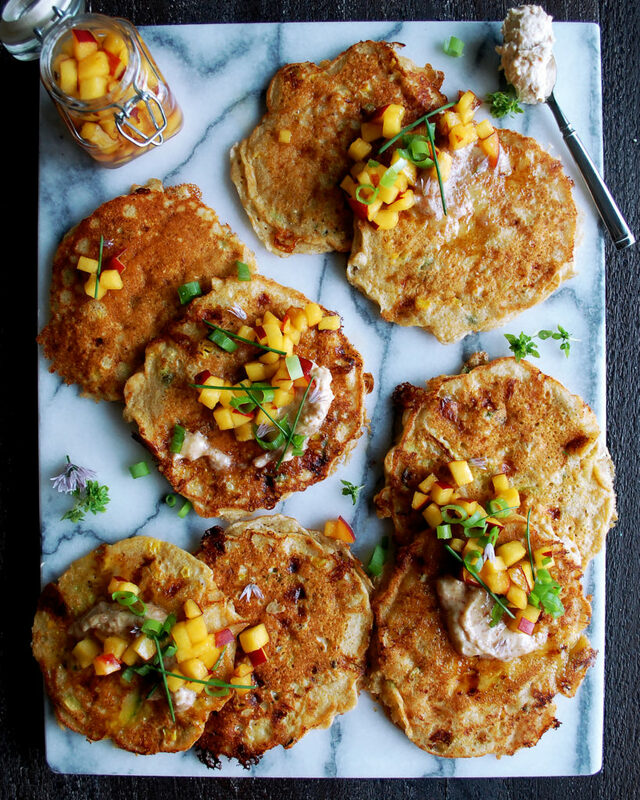 Serve the cornmeal pancakes with a dollop of prosciutto butter. Spoon the peach honey syrup on top, making sure to get a good amount of the honey liquid in the bowl. Garnish with scallions, chives, chive blossoms, and basil flowers. The honey liquid created from the peaches will be somewhat thin. If you want a thicker syrup, strain this liquid into a saucepan and reduce until thickened.